Version 1.1.0 has been submitted, it introduces the new feature "Generate Root Motion Animations" that allows to create a standard UE4 root motion animation from a Mixamo animation. To use this feature, you must import both the "normal" Mixamo animation and its "in-place" version. The plugin is officially available on Gumroad: https://gum.co/ue4-mixamo ! From there you can buy the plugin and have access to the source code and pre-build binaries (so no need to play with Visual Studio). Gumroad will be supported at the same level as the Epic Marketplace. As soon as Epic will complete its review, the plugin will be available on the Marketplace too. As Epic and Gumroad are different legal entities, be aware that purchases are not transferable. 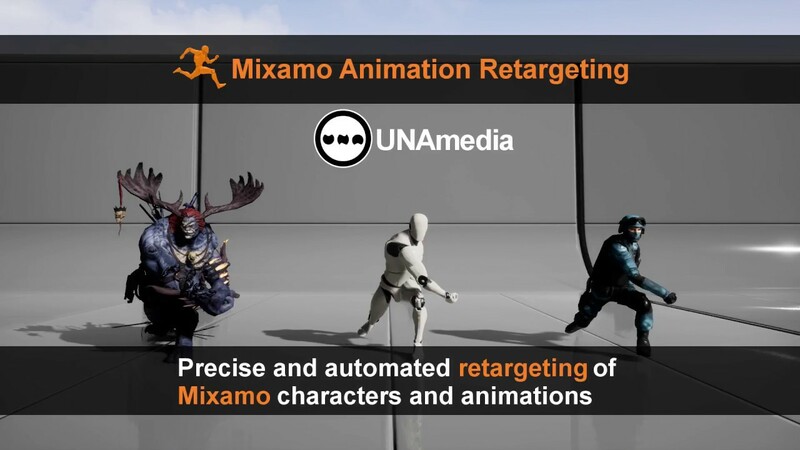 we just submitted "Mixamo Animation Retargeting", an editor plugin for precise and automated retargeting of skeletons, skeletal meshes and animations created with and exported from Mixamo tools (Auto-Rigger, 3D Characters, 3D Animations). Mixamo Animation Retargeting is an editor plugin that helps integrating Mixamo assets (exported from Auto-Rigger, 3D Characters, 3D Animations) into Unreal Engine 4.
a Root bone is added to the Mixamo skeleton (and all related skeletal meshes), allowing the use of Root Motion for animations (https://docs.unrealengine.com/latest...on/RootMotion/). ensure that the Unreal Engine 4 mannequin skeleton in your project has the “Humanoid” rig set. select a Mixamo skeleton asset and execute the “Retarget Mixamo Skeleton Asset” contextual action. The tool also supports batch processing. Note: This product is not made by, or affiliated with, Mixamo or Adobe Systems in any way. Automatic setup of Translation Retargeting options. Automatic setup of Rig mapping. Analytical computation of the exact Retarget Base Pose. Some bones preserve the original component space orientation due differences between Mixamo and Epic reference poses: "Head", "LeftToeBase", "RightToeBase". Addition of the Root bone to enable Root Motion animations. End results can be hand-tuned if needed. Animation Retargeting is done with the standard editor pipeline (Retarget Anim Assets > Duplicate Anim Assets and Retarget). Last edited by UNAmedia; 10-28-2017, 03:21 PM. Take my money ... seriously ... take my money!!! Huge time saver, can't wait to get this on my hands! Yeah this would be a great tool just for time saving. Sounds really useful, perhaps some might find the 35usd tag a bit pricey. Last edited by HeadClot; 03-20-2017, 07:19 PM. Hi! Thank you for all the nice comments, very much appreciated. The first screening has passed and now the plugin is under evaluation by Epic, I hope to be able to update this thread soon. As it seems a very similar problem, I think we could be able to develop a specialized plugin for this. We'll investigate it after the release of this plugin. The ability to instantly use hundreds of free animations without spending god knows how much time retargeting each and every one of them for 35 usd? It could easily cost double that without any issues. People still have the ability to retarget them manually if it's too expensive for them so win win. Check out my 2D Platforming Kit! So basically I can autorig a char in Mixamo, and retarget the generated rig to the UE4 skeleton? I mean, will this only work with Mixamo animation or I can use the Mixamo auto rig and retarget that rig to an UE skeleton based animation? I personally think 35 usd is a good price for such a plugin. My observation is that plugins in the marketplace are somehow expected to cost less by the community. There are many small differences between the mixamo and the epic skeletons, and while manually you can bring them very close, the retarget will be off in the end. I'm not sure if this can be fixed without reskinning the model. The arms will penetrate the chest and such errors will appear. How does this plugin will counteract the issue? Last edited by Konflict; 04-05-2017, 09:41 PM. thanks again for all the nice comments! Yes: you can autorig a char in Mixamo Auto-Rigger, import it in Unreal Engine 4 and then use the plugin to retarget its skeleton to the "standard" UE4 mannequin.